Accessories: Accompanied by Patek Philippe Certificate of Origin dated April 23, 2010, additional case back, fitted wooden Patek Philippe presentation box, box key, winding box, leather portfolio with glossy photograph, product literature and outer packaging. The Patek Philippe reference 5078 minute repeater other than being a superbly good looking and elegant watch is a gem of horological micro engineering. Powered by a self-winding movement with micro-rotor, its caliber R 27 PS is comprised of 342 parts and measures a very slim 5.05 mm in thickness. Winding is accomplished via a beautifully engraved micro-rotor, visible through the sapphire crystal caseback, and superbly integrated into the movement to permit an unobstructed view of the repeater’s hammers and gongs. The repeating mechanism features “cathedral gongs” meaning the gong on which the hammers strike to chime the time are longer than traditional ones. The gong in a standard repeating mechanism wraps around the movement once whereas those of the "Cathedral" mechanism wrap around the movement with a length equivalent to nearly two circumferences and are thus twice as long as standard ones. The result being a richer and fuller timbre with the notes lingering slightly longer. 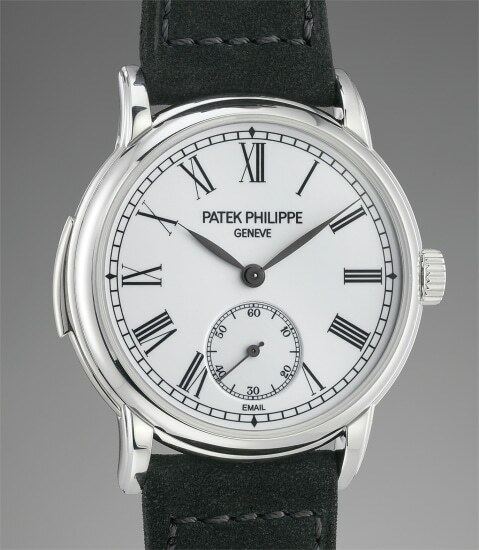 The present model is housed in an elegant 38mm platinum case with downturned stepped lugs reminiscent of another Patek Philippe iconic masterpiece, the reference 2499 and featuring a superb white grand feu enamel dial. Platinum is often considered to be a metal that dampens the sound of the chimes in minute repeaters, this is definitely not the case here as the chimes are clear and incredibly pleasant. Fresh to the market, in absolutely amazing condition and accompanied by all its accessories, the present Patek Philippe reference 5078 is the 10th platinum example with white enamel dial to ever appear on the auction market and would be a crown jewel in any important collection.